One of the big buzzes in the genealogical community right now is the ability to create multimedia stories of our families on various websites. Just add a few facts — names, dates, places — upload some family photos and documents, and voila! A polished finished product gets produced as if by magic, with music and timelines of events and more. 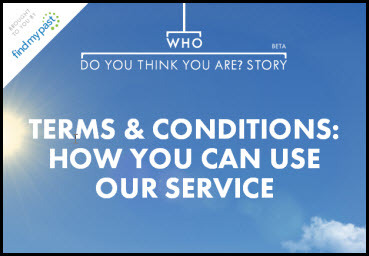 One of these services is the Who Do You Think You Are? Story website from DC Thomson Family History Limited, the parent company of findmypast (both the US and UK varieties). It’s a beta product at the moment, and it was being featured at last week’s 2014 Federation of Genealogical Societies conference in San Antonio. You keep the copyright in any content that you create or publish on the website, but by publishing it you give us permission (a non-exclusive, perpetual, transferable, sub-licensable, royalty-free, worldwide licence) to use it (including editing, adapting or modifying it as we wish) for any purpose and in any media now known or invented in the future. In plain English, by using the website and uploading anything — a photo, a story, any comments you share about an ancestor or about your research — you are giving the parent company, DC Thomson Family History Limited, an unlimited right to use what you’ve uploaded. It’s a license, meaning you do keep your own copyright in your own work, but it’s a license that allows DC Thomson Family History Limited to do just about everything that, ordinarily, copyright law says only the creator of the work can do: copy it, display it, create derivative works from it, and modify it. If you choose to upload something and create your story online, you must understand that you are agreeing to allow it to be used, edited, adapted, changed, and modified for any purpose the company chooses at any time the company chooses. It could use your story for advertising, if it wished, without paying you, and it wouldn’t even have to give you credit for it. And it can change the work — the story — you’ve created. That’s what you’re giving the company with the “editing, adapting or modifying it as we wish” language. Your grant of permission is perpetual — meaning forever — and it’s unrestricted. You can’t come back later and say you didn’t mean it; there’s no mechanism in place to have any content removed from the service unless it’s found to violate someone else’s copyright or is offensive or defamatory. The company has the right, under this grant of permission, to sell the entire operation, lock stock and barrel, to some other company down the road (that’s the transferable part), or to allow another company to use the content (that’s the sub-licensable part). You also need to understand that your work can be viewed and, potentially, used by everyone else who uses the website for their own personal noncommercial research. Let’s be clear about this: there’s absolutely nothing wrong about what Who Do You Think You Are? Story is doing; it’s not hiding a thing. It’s a commercial venture that’s trading you a place and a method to share your materials and in return you give the company the rights to your materials. If that doesn’t sit well with you — if you have qualms about it — don’t use one of these story-creation sites. It’s as simple as that. The problem is that there’s no definition of commercial purposes on the website. Could a genealogy professional create one of these stories for a client? Use a screen capture for a blog post? Use a short clip in a genealogy lecture? Are you a commercial user if your blog has Google Adwords or a FlipPal link? It isn’t clear. Bottom line: share with care. If you create one of these stories, you’ve given up control over it — completely and forever. Thank you Judy! I certainly appreciate you taking the time to help us understand the TOS from the vendors we work with. It really is important — and as long as folks know what the rules are, they can choose to play the game or walk away as they wish. Really enjoy your blog Judy! Thank you so much for the great article! Just watched a story on the WDYTYA Story web site (which I was not aware of prior to reading your blog) and did not find the product to be particularly interesting. It’s something a person could easily create themselves with, Power Point, and do a much better job in the process! And these kinds of conditions are exactly why I will share NO body of work on a public site! I have worked hard to put my family lines together, beginning with a few letters, a few pictures, and an undying curiosity about my ancestors. I am always willing to share with other family members but I’m not going to create even a possibility that someone with a “commercial” interest is going to make money from something I’ve created, with only my accomplishment as my pay. Some folks may think it’s a fair trade, Mary Ann, and as long as they understand exactly what the terms are, that’s fine. I just want to make sure everyone knows for sure exactly what those terms say. Thank-you for being our lawyer. Treating your family to a personalized “WDYTYA”-esque video sounds like the coolest Christmas gift ever, but not when you consider the potential for abuse. Some may regard it as just fine, Wendy. It’s an individual decision. So if I have a photo that I scan and send privately to a family member, I still have the copyright, correct? Now if that family member, without my consent, uploads it to WDYTYA and WDYTYA or someone else using their site copies and distributes my private photo, then what? I certainly never agreed to WDYTYA’s terms. If you own the copyright (not just the copy of the photo, but the actual copyright on the photo), you can file a takedown notice and WDYTYA (or any other website) will act in accordance with your complaint. Depending on what it is you’re sharing, and how you’re sharing it, there’s no good reason NOT to share: that’s what we do as genealogists. But caution in how we share is always called for. Thanks for pointing out these provisions. Did yiu notice whether they also included the common “We reserve the right to change or replace these terms and conditions at any time by posting the new or revised set of terms and conditions ob our website, and the changes will become effective upon posting.” I hate that one because it puts on the user the unreasonable burden of re-reading the entire T&C page daily in order to find out what, if any, changes may have been made overnight. Changes to this agreement: Any changes we make to this agreement will be made on this page and dated. If they are material changes (as opposed to minor typographical, stylistic changes or those that will not affect the service provided to you) and you are not happy with these changes, please let us know. If you do not agree to the new Terms & conditions, we will cancel your account. Just to add a little balance …. this Condition is a standard one in the T & C’s of many websites which allow users to upload images or data and has been for a number of years. It is common… which, of course, doesn’t make it good, just common.